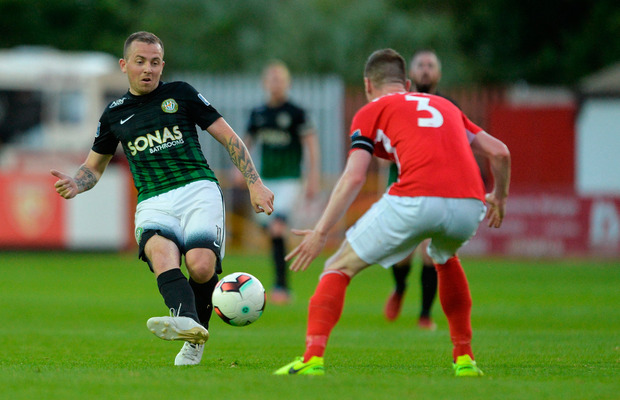 As he plots a new phase of his career, probably across the border in the Irish League, veteran Gary McCabe admits that he has real fears for the future of his former club Bray Wanderers. McCabe, who won a league title during his six seasons with Shamrock Rovers, spent last season with Bray, but his contract is up and he's leaving the Wicklow club. He played on a PFAI team, made up of out-of-contract players, in a friendly on Thursday night but the winger is not short of admirers, with contract offers from clubs on both sides of the border. Having spent 11 seasons in the League of Ireland he is keen to try his luck in another jurisdiction and is likely to move to the Irish League. "I always wanted to try another league and I'd like to play in the North, to see what it's like, there is a good bit of interest from clubs up there so I will make a decision soon," says McCabe. "I have offers from three clubs in the Irish League and there is interest from teams in the league here as well, so there's no panic in terms of signing, but I feel I have a lot more in me." But he still has concerns about Bray, where he was a key player last season in the most traumatic season in the club's history. Since the end of the 2017 campaign, a highly-controversial one for the club, manager Harry Kenny and a batch of players have left. Only four senior players are signed up for the 2018 campaign, there is no manager in place and there are already doubts being expressed about Bray's capacity to compete in the Premier Division next season, with a possible reprieve for a Galway United side who had been relegated, should Bray be denied a Premier Division licence. Earlier this week player Keith Buckley, who has one season left on a two-year contract, was forced to approach the club via social media to look for news about plans for 2018. "At least get in contact an announce to the players that are under contract for next year what is going on and when we're back training ! how do ye expect a club to compete, it's an absolute embarrassment to players fans and to the LOI itself," Buckley said on twitter. "I don't think anyone knows what's going on at Bray," says McCabe. "I can't completely rule out the idea of going back to Bray but it would depend on a lot of things, budgets and manager and things like that. "If there was a manager and a structure in place, if Harry Kenny was still there as manager I imagine I'd have had talks with Bray about a new contract. If there was a manager in place now he could speak to you, but with no manager there, no one has any idea what's going on. "Other clubs have their budgets and their plans for pre-season in place so I can't afford to wait around." McCabe has spent four seasons, over two spells, with Bray but he is concerned about the club right now. "You'd have to be worried," he says. "You're not even hearing rumours, there is nothing at all coming from the club. "Everyone assumed that they would have a manager in place by now, most of the other teams are back for pre-season early next month but Bray don't know when they are back as there is no manager. With four players and no manager, I can't see them having things in place before Christmas," he added.